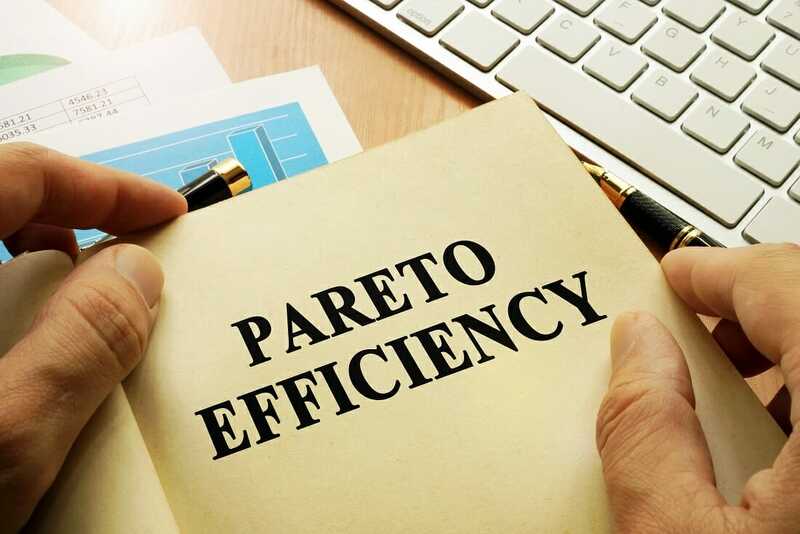 Pareto Efficiency, a concept commonly used in economics, is an economic situationAggregate Supply and DemandAggregate supply and demand refers to the concept of supply and demand, but applied at a macroeconomic scale. Both aggregate supply and aggregate demand are in which it is impossible to make one party better off without making another party worse off. To clearly understand the concept of Pareto Efficiency, it is important to introduce the concept of Pareto Improvement. Pareto Improvement: A resource allocation is Pareto improved if there exists another allocation in which one person is better off, and no person is worse off. Pareto Efficiency: A resource allocation is Pareto efficient if no Pareto improvement is possible. Therefore, Pareto Efficiency indicates that resources can no longer be allocated in a way that makes a party better off without harming other parties. In Pareto Efficiency, resources are allocated in the most efficient way possible. 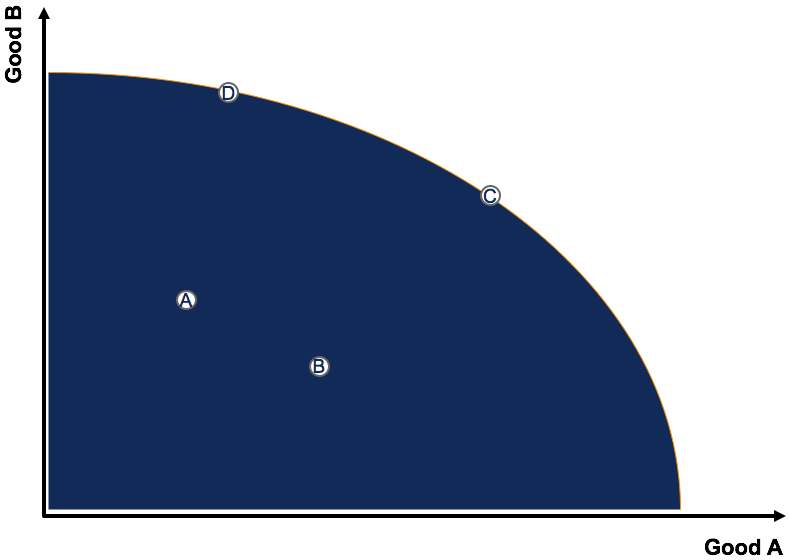 Consider points A, B, C, D above – which are Pareto efficient? Recall that resource allocation is Pareto efficient if no Pareto improvement is possible. Points A and B are Pareto inefficient because there is a possibility of increasing output of both goods A and B. It would be a Pareto improvement as the total outputGross National ProductGross National Product (GNP) is a measure of the value of all goods and services produced by a country’s residents and businesses. It estimates the in the economy increases. Points C and D are Pareto efficient because there is no Pareto improvement possible. Increasing the output of one good would decrease the output of the other good. Therefore, every point on the PPF frontier is Pareto efficient. Is the allocation above Pareto efficient? To determine whether an allocation is a Pareto efficiency, it is important to determine if a Pareto improvement is possible. As in, is there a way to make an individual better off without making someone else worse off? In the example above, a Pareto improvement is possible. If the allocation of oranges went to John and the allocation of apples went to Colin, both individuals would be better off while no one would be worse off. John has a preference for apples while Colin does not have a preference for apples or oranges. Therefore, the current allocation of apples to Colin and oranges to John is Pareto inefficient. For the allocation to be Pareto efficient, apples should be allocated to John and oranges should be allocated to Colin. Is each allocation above Pareto efficient? The example illustrates an important aspect of Pareto efficiency. That is, Pareto efficiency does not equate to fairness or equality. Allocations in the first and third allocation illustrate that even though the opposing individual does not have any chocolate bar, it is Pareto efficient because allocating a portion of the chocolate bar to the individual who does not have any would make the person who is losing that portion of the chocolate bar worse off.